What to eat if you need natural and organic clear liquid diet colonoscopy test options. Includes products that can be found at your local retailer! They sure have a great sneak attack. Love how they just come up behind you and attach themselves like leeches no matter how much you might try to avoid them. Turning thirty was rough. The first big milestone always is. I cried for about two weeks. And then as I eased into my thirties I found that they were actually pretty liberating. The demands and worries are a lot more than in my twenties, but it’s a really fun time of life. Watching my family grow and mature, taking on bigger career changes in my professional life and feeling like we are moving forward in life while feeling like it is just flying by is fun and challenging. My body seems to endure more–longer runs, more challenging workouts and steadier paces than it used to. Weekends can finally be spent relaxing!! Parties end earlier than they used to since most of us have kids waking us up by 7 or 8 the next morning. I love being the age that I am. It has it’s challenges too. Like many of us, certain milestones bring certain…inconvienences. In my thirties it was all the blood work and other fun tests. 40? Mammogram. 50? Colonoscopy. Your list might look a little different and your instructions might differ a little bit too but the general rule of thumb is it may not look like there are a whole lot of options for you if you eat organic or natural. For me, I generally don’t consume fruit juice. Everytime I think of having a juice, my mom’s “don’t drink your calories” goes through my head. Her philosophy was always to waste your calories on the good stuff like chocolate than to waste them on juice that still leaves you thirsty. And jello? Most of them contain food dyes. Jello isn’t readily seen in the health food aisle. The list goes on and on. So what CAN you have if you need to be on a clear liquid diet but don’t want to change…or CAN’T change your eating habits for dietary reasons? There are some fabulous products on the market. All of the products mentioned here were found at major retailers like Target and Walmart. I did not get compensated in anyway for this post or for mentioning any specific products. Bolthouse Protein Plus Drinks: One of the things that a clear liquid diet doesn’t include is a whole lot of protein–the food that gets you through the day. Protein keeps you satisfied and less hungry. These drinks from Bolthouse include about 30 grams of protein and 400 calories in a 16oz drink along with three servings of fruits (if you go for the fruity tasting drink) and soy and whey protein. They come in great flavors like vanila bean, chocolate and mango. I really enjoyed the smooth flavor and the lack of seeds and pulp. You can find these in the refrigerator aisle by all the juices. As I walked around the store I had a hard time finding anything that didn’t look heavy on the dairy or would have seeds or heavy sediment or pulp in it. This is a tough one because you will probably need to make your own jello. Most of the health food stores carry plain grass fed gelatin either in bottles or in bulk. If you don’t have the time to make an extra trip to the store, I suggest just grabbing plain gelatin from the shelf (in the jello aisle). Grab one of your favorite juices and use it to make some jello. It is important to drink light colored juices the day before your procedure. This includes apple juice, white grape juice, and white cranberry juice. The great news is most natural and organic juices include varieties of that. The bad news is they actually use a lot of the pulp and there is quite a bit of sediment at the bottom if you hold the bottle up. Natural varieties from Target contain no corn syrup and no added sugar. It’s important to stay hydrated. During the course of the day eating a diet of jello and broth will cause you to feel really drained and tired really quick. To keep your body hydrated and give it some vitamins to help combat that feeling a little more choosing nutrient rich clear liquids is important. Coconut Water: This is a great option for staying hydrated. Natural varieties like Vita Coco, O.N.E. and Zico are good options and contain more potassium in one serving than a banana. Broth: There are a lot of great organic and natural broths on the market. Pacific and Imagine are easily found at major retailers and don’t cost much more than the non organic varieties. Look for lower sodium options if you can since you don’t want the excess sodium to take away nutrients your body needs (that colon prep drink is just around the corner and it does a great job of that). Bone Marrow Broth: Bone marrow broth has become really popular in the past year. Those who use it talk a lot about the health benefits including immune support. Bone marrow broth for colonoscopy preps can be very beneficial to helping your immune system. You will want to try to make this a day or two ahead of when you need it as it will take time. We loved this guide from Plan To Eat which tells you how to make the bone marrow broth. (Just admit the part when you add the vegetables). This guide from Primally Inspired tells you which animal bones to use and how to freeze and store your bone broth. Ice pops? Yum. Not really. But when I walked through the store I was a little disappointed to find that the only true popsicles that would qualify for a clear liquid diet contained dyes. Or were fruit pops that contained real fruit. Bummer. Those are my favorite. If you are enjoying a summer time colonoscopy some popsicles might help fill you up while keeping you cool. Try pouring some white cranberry, apple juice or white grape juice into popsicle molds and freezing. Zevia, Hansens and Oogave are some of the more well known natural and organic sodas on the market and are great options. Depending on the store you may or may not be able to find them. Look in the soda aisle or the natural food aisle. Hint: We loved mixing up some of these sodas and making sparkling jello with them. There are a number of great coffee and tea products on the market. Celestial Seasonings and Tazo are two teas that you can find pretty easily in any store. Seattle’s Best, Fair Trade and even Target’s store brand Archer Farms sell organic coffee. A clear liquid diet isn’t that hard to get through when you are armed with plenty of options and brands to help you get through it! This was very helpful! When I looked at the colonoscopy prep instructions, I thought, “Ewe, yuck, none of this is healthy!” Your ideas are wonderful. I just poured my homemade pastured chicken broth and natural all-fruit juice through a cheesecloth to remove any sediment. I also made some gelatin cubes by heating up 2 cups of tulsi tea and 2 cups passion fruit juice, and mixing in 3 tbsp grass fed beef gelatin and a little stevia after the mixture cooled to room temp. Bonus: the tulsinis good for hormone balance, and the gelatin is good for your nails, bones and skin. If you really don’t want to drink fruit juice you can just use herbal teas and stevia to make the gelatin. Thanks Katie for the tips! Thanks Katie for the tips! Your jello recipe sounds delicious! Pacific foods makes bone broths in cartons. They dont look clear. ARe they drinkable? or must they be strained? I think they are okay but you can strain them if you would like. thank you. I am just about to open some coconut water after reading this. Its a much better option than the ones given by the doctor. So glad that this option worked better for you. Hope your test goes well. The Bolthouse Farms chocolate Protein Plus lists “low fat milk” as the first ingredient. Thanks, this is something that i had early on in the morning right at the 24 hour mark so I could have some more protein. I’m looking for other products that would fit this but for now leave it on my list. Thank you for mentioning specific products, it is such a big help to me. The list the doctor provided was somewhat vague. One thing I’m not sure about is why they call chicken broth and or bone/broth a clear liquid. Every brand that I have found looks cloudy, leaving me wondering if they are acceptable to consume as a clear liquid. Very frustrating. I purchased Simply Lemonade, and while I’m told lemonade is acceptable…it is not clear, though I couldn’t discern much sediment in it. I made some homemade Jello with it , which turned out delicious. I’m hoping this product is okay to meet the needs of a clear liquid diet. I bought some vegetable broth and strained it, afterward I could see that there had been a lot of sediment in it. I wonder if Stevia is allowed on a clear liquid diet? Thank you for taking the time to write. Great tips and suggestions. 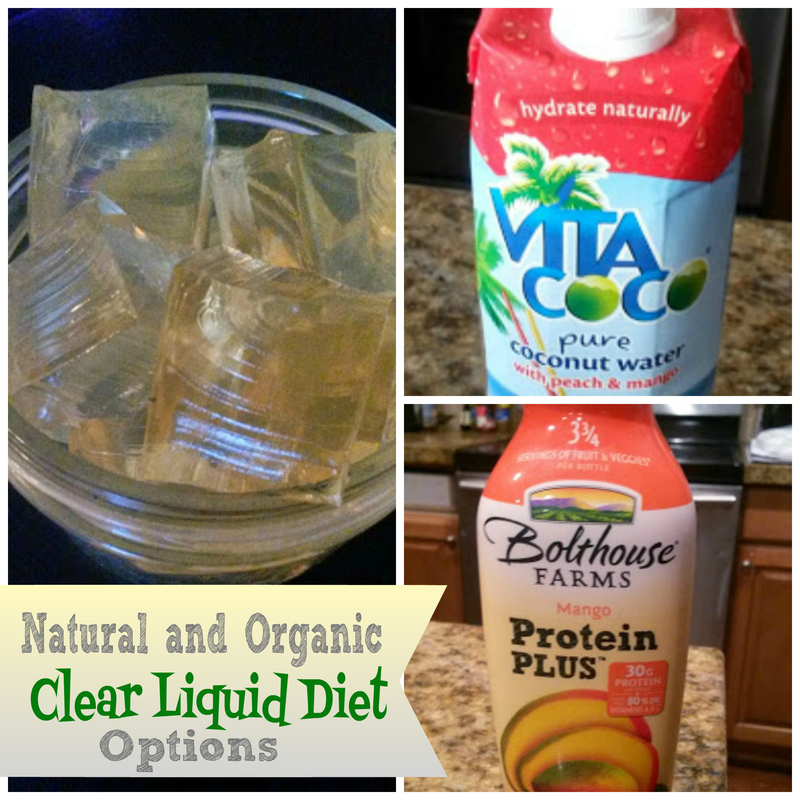 It’s interesting to hear how each clear liquid diet suggestions vary. Yes chicken broth is considered clear liquid however like you suggested I would strain it. The bolthouse protein vanilla bean drink is not clear at all.